Hip hop legend DJ Mister Cee opened up a major door for South Asians in Hip Hop this week! DJ Sharad does this for the culture, the artists, and the music. 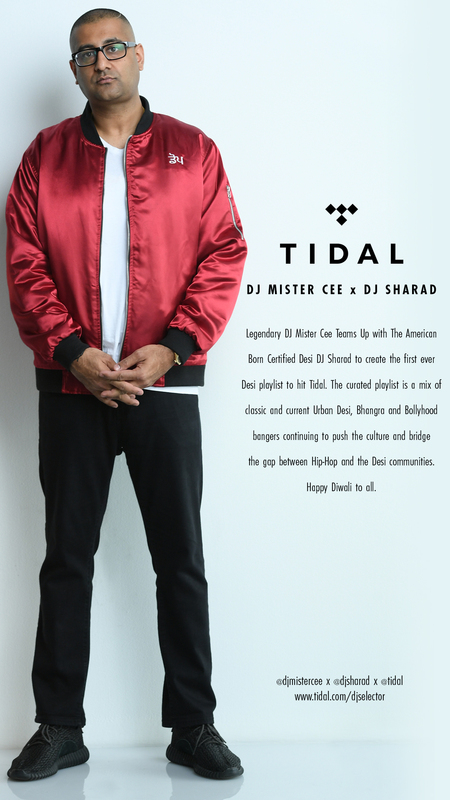 Sharad made history today by being the first Indian DJ on Tidal with a specially curated "Urban Desi 4 Diwali" playlist he did with with the iconic DJ Mister Cee ! Thank you to Mister Cee , the good folks at Tidal , Roc Nation , and everyone who believes in the parallel between the Desi and Hip Hop community. Check the mix as Mister Cee & Sharad pay homage to OG artists including @panjabimc @jaysean @ballysagooofficial and the current generation @raxstaruk @iammickeysingh @amarsandhumusic @prannamusic @fatehdoe @vivianakadivine @jasminesandlas @anikkhan_ @iamzackknight @pavdharia @therajakumari and more! We ask everyone in our community to repost this for the culture. We need this for our artists to be heard on one of the biggest digital platforms in the world. Check out the "Urban Desi 4 Diwali" Playlist!